Optidrive E3 variable frequency drives (VFDs) from Invertek Drives have completely automated the control of pumps used to fill and empty ballast tanks on board commercial barges in the Netherlands – saving manpower, time, energy and money. Located at the bottom of the vessel, ballast tanks are designed to add weight to aid stability when the vessel has no cargo, and to enable the craft to pass underneath low bridges. 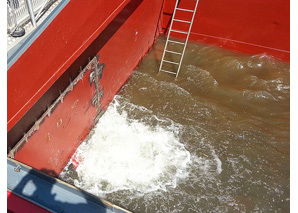 They are filled with water pumped from the river or canal and then emptied again as soon as the bridge has been successfully cleared, or cargo taken on board. As well as a faster and more reliable filling and emptying process, operators of commercial vessels that use VFD controlled ballast pumps also benefit from less fuel and energy consumption, which also saves money. Automated control of the tanks mean they are emptied as soon as the excess weight is not needed which reduces drag, whilst controlling the pump speed and starting / stopping reduces the peak load on the vessel’s electrical system. Reducing fuel and energy usage is a vital consideration in the shipping industry which is required to adhere to strict international emissions regulations. The Optidrive E3 from Invertek delivers reliability, high performance and efficiency in a compact, easy to use unit which is ideal for marine environments. Available in enclosure ratings IP20 and IP66, Optidrive E3 offers conformal coating and is designed to operate trouble-free in the 50°C temperatures frequently found in environments such as vessel engine rooms. 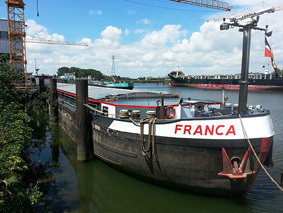 The frequency of bridges on the Netherlands’ canal network means the tanks need to be filled and emptied again as quickly and easily as possible, whilst the volume of water used meant VDE Marine needed a high-performance variable speed drive capable of consistently controlling the 11kW motor. Thanks to the remote control functionality, the barge’s operator is able to switch the AC inverter on and off, change the setting on the pump from full to empty, amend the pump speed, and open and close the valve relay whenever required using the drive output relay. When the valve is being closed, the Optidrive E3 drive controls the pump speed to ensure water from the river or canal does not flow back in to the ballast tank – a vital consideration when emptying the tank. Variable frequency drives, including DNV accredited products, from Invertek Drives are used in a huge number of motor control applications including a wide variety of operations in the marine industry such as winches, pumps, cranes, bow thrusters and compressors. John comments, “The pump motor, controlled by the Optidrive E3, enables 1.1 million litres of water to be pumped every hour if required. The complete system was commissioned before being fitted on the barge to ensure the on-board installation was as quick and simple as possible. 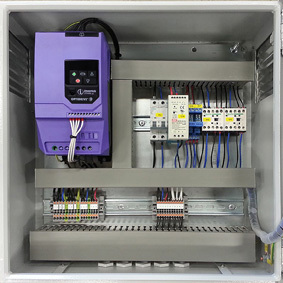 Invertek Drives has extensive experience in energy efficient pump control and can even manage multiple pumps at the same time thanks to Optiflow technology. Find out more by watching this short YouTube film. Please follow this link to find out more about how Optidrive variable frequency drives from Invertek Drives are used in the marine industry. More details about Optidrive E3 can be found by downloading the E3 brochure.